I’ve always liked beets, but there was a time when I got to the point of dreading one more beet at the end of the season. My thinking seems to have changed since these days I look forward to having some roasted beets in the refrigerator. I like cutting roasted beets into wedges and adding them to salads with crumbled goat cheese, and I really like adding roasted and pickled, sliced beets to sandwiches. But, with our latest CSA beets, I wanted to try something different. I remembered a recipe from the files that had been waiting its turn for almost nine years. Every time I flipped by it in the files, I noticed those colorful red and golden beet slices in neat, layered rows. This is from a 2004 issue of Living magazine, and the recipe is available online. The original version was made with red, golden, and Chioggia beets, but I went with just red and golden for mine. Being a beet tart, it sounds virtuous, but the buttery crust, the mix of fresh cheeses under the beets, and the shredded fontina cheese on top make it delightfully rich. It’s the kind of dish that involves a few steps to get things prepped, but then it all comes together simply in the end. To make a meal of it, an arugula salad on the side is a good match. I started the prep a day in advance by roasting the beets and making the pate brisee. The next day, the pastry was rolled into a big rectangle and fit into a nine-by-thirteen inch baking sheet. The pastry was chilled before being blind-baked with pie weights. Meanwhile, the roasted beets were sliced on a Benriner. If you slice the golden beets first and stack them away from where the red beets will be, you won’t have to worry about red stains on the golden slices. The bottom layer of the tart was a mix of goat cheese, fresh ricotta, and chopped herbs. Thyme is suggested in the recipe, but I used what my garden had available which was garlic chives, oregano, and parsley. After spreading the fresh cheese mixture, the beet slices were layered on top, alternating colors, in each row. Shredded fontina was sprinkled on top, it was drizzled with olive oil, and salt and pepper were added. The tart then baked for about 25 minutes. Now, I have one more reason to look forward to having beets on hand. I might even have to start stocking the freezer with them. How do you feel about beets, and if you have a favorite way of using them, what is it? love beets! this is absolutely gorgeous. Beautiful and really appetizing! A tart I'd eat with great pleasure. I have fallen in love with beets recently. I think this cheese tart will make my husband to like beets too. Thanks for sharing. I have got to try that puff pastry recipe, and I most definitely need to try beets (which I embarrassingly have only had in borscht). Your tart is just too gorgeous Lisa! 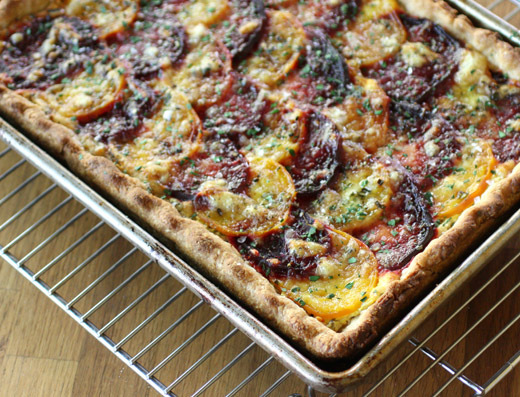 I love beets and this tart looks DELICIOUS! It's so pretty and it's definitely a different way to enjoy them. I adore beets! Don't see golden beet in our market very often. The tart looks super! 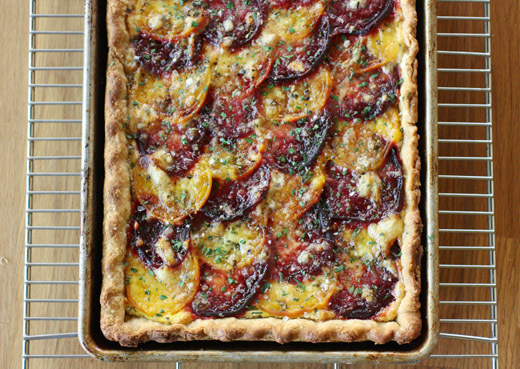 So pretty this tart with red and golden beets...love the cheese on it as well...very elegant Lisa. I'm also a beet fan Lisa. This looks really good. Thanks for the recipe and the two links. Always looking for ideas. I love to learn new recipes with beet! I often have it in salads and with goat cheese, so this tart will be a great change for me! I have yet to convince my daughter that beets taste good! This might just the recipe to change her mind, a dazzling tart! I LOVE beets and I don't hold it against the Aussies for calling them beetroot - they taste the same. I adore this tart and will have it in my belly before the week is out! Even though I don't like beets, this is too pretty to overlook and I love tarts. They are so versatile. Oh yum, your tart looks so delicious! I'll have seconds, please. ;-) Really nice recipe! 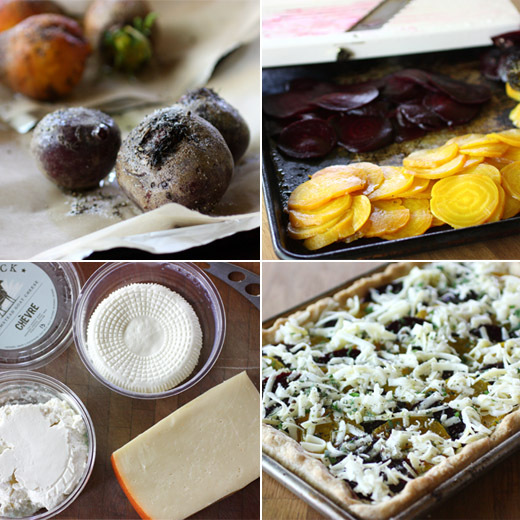 I love roast beets, and love the idea of this tart - I haven't had beets this way. Super post - thanks. I love meals that look beautiful and taste great. What a terrific recipe! This is beautiful and I would love to try it as I love beetroot. i can't help it--i think beets taste like dirt, even when they've had a lot done to them. that said, this is a beautiful tart!